The three types of collaboration areas within ESIP are Committees, Working Groups and Clusters, which range from formal (Committees) to less formal (Working Groups and Clusters). Anyone interested in working in one or more of the collaboration areas listed below are welcome to participate in the monthly telecons; participation does not require your organization to be an ESIP partner. To stay up to date with collaboration area activities and general ESIP happenings, check out the collaboration area updates on our blog, sign up for our weekly Monday Update and the ESIP-All list-serv. The DMT Clearinghouse is a registry for online learning resources about research data management. Initial seed funding was provided by the U.S. Geological Survey's Community for Data Integration. Developed in collaboration with the Earth Sciences Information Partnership (ESIP) Federation, and DataONE, the DMT Clearinghouse is available for searching, browsing, and submitting information about learning resources on data management topics. The Data Stewardship Committee develops and fosters practices and standards in the field of Earth science informatics with a focus on providing stewardship to Earth science system data, thereby aiming to facilitate their long-term management, preservation and curation. The Committee's members represent and participate in various US and International data stewardship organizations. Additionally, the Committee members collaborate extensively in activities spanning data science and earth system observations, including through the Committee's monthly telecons and academic publications. Through these efforts, Committee members contribute their expertise to assist ESIP in achieving its strategic goals, and assist in sharing and exchanging their experience and lessons learned from the ESIP community. • Encourage the use of best information technology practices to ensure the quality, usability and breadth of standards and protocols relevant to interoperability. To encourage and promote research and development of semantic technologies in support of Earth science data management, data discovery, data dissemination and data analysis. To collaborate with ESIP members, working groups, clusters and committees to identify semantic methods and tools that support the adoption of semantic technologies within ESIP and across its member organizations. The Visioneers is an ad hoc working group that plans, evaluates and oversees the biannual ESIP meetings in January and July. Visioneers is open to anyone interested in helping the meeting development and evaluation process to process smoothly. New ideas, input and feedback are always welcome. The Visioneers meet monthly (sometimes more often) as a telecon as long as is necessary to ensure that the meeting agenda and logistics are well established. Least formal ESIP groups. To start a cluster email the ESIP Vice President, VP@esipfed.org. The purpose of ESIP’s Agriculture and Climate Cluster is to foster a better understanding within and outside the ESIP community about the value of applying agriculture-related data to the impacts of, and mitigation efforts for, climate change; the systems and services used to develop those data; and the problems and solutions available for managing the data. Past activities have provided opportunities for mutual education and cross-collaboration among U.S. national and international organizations that produce and apply agriculture and climate-related data. These organizations include the U.S. Department of Agriculture (USDA) Climate Change Program Office, the USDA Long-Term Agroecosystem Research (LTAR) Network, the USDA Climate Hubs, the Agricultural Model Intercomparison and Improvement Project (AgMIP), Climate.org, and others. The Cloud Computing Cluster’s goal is to help ESIP members understand better cloud computing. The work of the Cluster enables ESIP partners to share experiences of adopting cloud computing, making data and service available, and integrating systems through cloud platforms. The Cluster provides professional suggestions and guidance to ESIP members for what cloud computing can do or how cloud computing can help when they seek for cloud solutions, and fosters collaborative research on cloud computing architecture, reference model, and relevant new technologies. 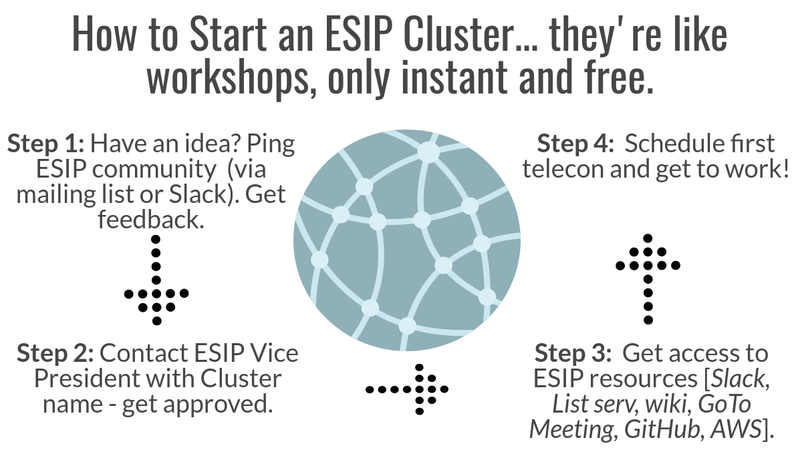 The ESIP Community Data cluster will be a connection point for local organizations and community organizers looking for data to support community needs. We will work with local experts to assess data requirements, align these needs with existing resources (e.g. people, data) and work to connect them. ESIP members wanted a simple repository that would let users try out semantic technologies, understand their benefits, and explore possible applications that used semantic resources. The Community Ontology Repository (COR) is a deployment of the Marine Metadata Interoperability (MMI) project's Ontology Registry and Repository software, meant specifically for use by ESIP and the Earth Science community. The COR Cluster supports the maintenance of the COR and aims to build community around and grow usage of it. “Data to Decisions for Climate Resilience” comprises a group of individuals who shall collaboratively build openly web-accessible concept maps for climate adaptation. These concept maps benefit those who seek to better understand how data may be transformed into information along the data-to-decisions pipeline for climate resilience planning. The objective of the Disaster Lifecyle Cluster is to facilitate connections and coordinate efforts among data providers, managers and developers of disaster response systems and tools, and end-user communities within ESIP. The Discovery Cluster began as the Federated Search Cluster in 2009 to address the problem of discovering Earth science data over the widest possible variety of data providers. In keeping with the federated aspect of the ESIP at large, a federated search solution was developed based on the OpenSearch conventions. In January of 2011, the Federated Search Cluster was broadened to include subscription based (“casting”) methods of discovery, at which point it was renamed the Discovery Cluster. The Discovery Cluster works to develop usable solutions to the problem of distributed and diverse providers, leveraging existing standards, conventions and technologies, with a predilection for simple solutions that have a high likelihood of voluntary adoption. The goal of the Documentation Cluster is to improve understanding, utilization and integration of all of the multiple metadata dialects used in the global environmental community. Equally important, we will work in the spaces between these dialects to build understanding from the similarities and differences between them. A dialect is a “variety of a language that is a characteristic of a particular group”. In the context of data sharing in ESIP, the ways that different groups document their data and products (i.e. metadata standards) are great examples of dialects. They are varieties of the overarching language of documentation that are used by particular groups in ESIP and other partners in the global environmental community. In response to a growing interest in the use of drones, unmanned aerial systems or UAS, in the Earth sciences, the Drone Cluster is focused on understanding, communicating and furthering the development and use of drones as tools for science research. While there are currently various challenges around using UAS, the existing and anticipated advantages mean that firstly the domain is swelling with innovation, and secondly that UASs are expected to become a standard piece of field equipment for scientists. The Cluster is exploring Drones with the ESIP community in two ways: (1) as tools for Earth science applications and research, and (2) as instruments with unique data management and standardization challenges. As a new cluster we are welcoming all participants and input as to how we can best operate within ESIP. The mission of the Earth Science Data Analytics Cluster is to promote a common understanding of the usefulness of, and activities that pertain to, Data Analytics and more broadly, the data scientist;. We facilitate collaborations between organizations that seek new ways to better understand the cross usage of heterogeneous datasets and organizations/individuals who can provide accommodating data analytics expertise, now and as the needs evolve into the future. We also identify gaps that, once filled, will further collaborative activities. The Cluster provides a forum for academic discussions that allow ESIP members to be better educated and on the same page in understanding the various aspects of Data Analytics. Earth Science Pre-print Cluster will discuss preprint services and address topics such digital publication, indexing taxonomies, citation standards, advertising, and related issues surrounding shared governance and community building. We will begin by examining the Center for Open Science’s preprint service, which is build on top of their popular Open Science Framework. We will also discuss shared governance and how best to engage other societies and interested parties. The objective of the Energy and Climate Cluster is to facilitate interactions and build better connections, both technical and interpersonal, among policy and decision makers, climate change and energy data providers, decision support tool providers, and end users. We do this through multiple targeted activities, including the coordination of U.S.-based activities in support of the Group on Earth Observations (GEO) energy work program task, formulating case studies for the US Climate Resilience Toolkit in collaboration with the Agriculture and Climate cluster, improving access to energy-relevant Earth observations, and advancing end-user engagement and education. Among the topics we discuss are the energy-water-climate nexus; climate change impacts on energy supply and demand; predictions, projections and uncertainty quantification; and renewable energy planning. Our activities are carried out through sessions organized at ESIP meetings and by individuals who share progress through our monthly telecons. The EnviroSensing Collaboration Area was organized around the need to create resource guides to assist environmental research efforts in developing deployment strategies for real-time sensor networks. Sensor networks are commonly deployed at environmental research locations and require management of subsequent large volumes of near real-time data. A working group of practitioners experienced in the entire life cycle of streaming sensor data, including sensor network establishment, data transmission, data storage, quality control and assurance and data access, has developed a best practices guide for managing sensor networks and data. The objective of Information Quality Cluster is to bring together people from various disciplines to assess aspects of quality of remote sensing data. We will be learning and sharing best practices with a goal to build a framework for consistent capture, harmonization, and presentation of data quality for the purposes of climate change studies, earth science and applications. The efforts and goals of this cluster are not predefined and are motivated by the participants of the cluster, so new ideas and participants are always welcome. The goal of the Marine Data Cluster is to bring together ESIP members working with data in the marine geosciences to discuss advancements and challenges in their field, and to build relationships to foster future collaborations. This cluster was created to take on the broad challenge of general research object citation. How do we provide a reference that enables both access and credit to any given research object (data, software, article, instrument, sample, workflow, etc.)? The mission of the Science Communication (Scicomm) Cluster is to help improve the understanding of science overall, as well as Earth science and data science in particular, both within and outside of ESIP. We bring together people from various disciplines to improve science communication by providing a forum for discussion and developing resources to better train scientists in the art of science communication. Specific goals and objectives will evolve with the interests and strengths of active cluster members. The mission of the Science Software Cluster is to explore ways to support the sustainability of the software products developed for use with scientific workflows and data. We encourage input from all interested parties to help evolve our approach and projects. This cluster will investigate the best practices for citing both software, and services provided by tools, that lead to data analysis. Citations for software and services are important because it gives credit to the developers, provides provenance on how the data were analyzed and helps with reproducibility. However citing software and services are difficult due to its dynamic nature. Another issue is how to tie a relationship between the data and software. These issues will be addressed in this cluster. This group formed in late 2015 to investigate pathways for sustainable increased collaboration and coordination in the area of environmental data management that will benefit both research networks and also individual investigators. The group has three major activities: Developing a framework for describing Return on Investment (ROI) in data repositories; describing the landscape of data services offered by repositories, to identify gaps; and defining a Common Technical Vision to sustain data, rather than the repositories themselves. This cluster aims to discuss the applicability of using User Interface (UI)/User Experience (UX) principles and techniques in evaluating and enhancing the services offered by data archives/repositories. In particular, the cluster will review usability principles and common usability evaluation techniques as well as the different areas in which these principles and techniques could be applied in a data archive/repository setting. The cluster will also collect and annotate usability resources, such as usability evaluation tools and relevant conference/publications, as well as perform usability case studies. Ultimately, the cluster aims to demonstrate through practical examples that UI/UX analysis and design need not be burdensome in order to yield immediate results and that these experiences could be shared with the great community to enhance user interactions with the data archives/repositories as a whole. The purpose of the VR/AR for Science Cluster is to help ESIP members understand the emerging virtual reality (VR) and augmented reality (AR) technologies that are available and how they can be leveraged for scientific research, visualization, and communication. The VR/AR for Science Cluster allows ESIP partners to share demonstrations of VR/AR technology, use cases of this technology for science, developments in the hardware/software related to the technology, and experience and suggestions for implementation. The Cluster provides information to ESIP members as to how VR/AR technologies are used currently, with a continual focus on cutting edge developments in the gaming sector (hardware, controllers, etc.) that can be applied to scientific domains. The VR/AR for Science Cluster fosters a collaborative environment for sharing resources and a foundation for building a community of scientific users of these technologies.